Home alone with not much to do, except for mundane tasks. I’ve got an annoying cough that won’t cease to be! Might watch some Breaking Bad, if I can’t think of anything else.. I guess it’s just a matter of time when all TV is on the internet. Once the tech-savvy generation that grew up with the Internet is oldest generation alive, companies won’t have any trouble moving their transmissions and programs online. Watching TV shows on the TV doesn’t interest me anymore. It’s freeing to be able to watch shows you wanna watch whenever it suits you, instead of being locked in a schedule, which might not fit with the rest of your life. It’s also more engaging to watch several episodes of a show on consecutive nights, instead of watching one episode a week. Shows with an overarching storyline, such as House, Walking Dead, Breaking Bad or True Blood become immensely more enjoyable when you’re able to watch the episodes with less time in-between them, but on the other hand with shows like CSI, Flashpoint, South Park or Seth MacFarlane’s shows it doesn’t really matter, since there isn’t much of an overarching storyline. Anyway, I can’t wait ’till I have a chance to purchase shows online at an affordable price, without having to get DVD discs or whatever. I’m a bit disappointed at how slow Mercalli XII is happening. I feel like I should be doing more to get stuff done… On the other hand I’ve been working on some of my own music, after rummaging through my old music ideas folders. Thousands of files of random ideas and songs ranging from weird black metal stuff to strange attempts at serialism. Sometimes in the same idea. I kinda wanna write a song and record it all by myself, just to get the feeling of progress. The good part about playing in a band is not having to memorize and learn to play all the parts, which can be a drag when doing solo stuff. So this is what it means to be old, I guess. Old as in adult. Sometimes I wish I just got a day off from being me. It doesn’t seem like I’ve had a day in ages when I wasn’t responsible for EVERYTHING happening in my life. If something breaks, well… I can count on myself to fix it! If something needs to be done, in which I’m not the only one with a stake in… you guessed it: I’m on it!… End of rant. Had fun playing some music with a friend of mine the other day. She’s from the other side of the musical spectrum, but we have certain areas of pop that cross over (and she had a bunch of chords) so we were playing for hours on end. Reminds me that I should brush up on some funky chords and voicings, so I can execute them with more ease. Visited my brother and his girlfriend today. I gave him Minecraft as a graduation present and he’s been playing it eagerly, although he neglected to tell me before today, so I was thinking my gift was a failure. He showed me a few vids of self-repairing castles and that might be interesting to try out once 1.9 is out. Sofia also had fun visiting them. She was rolling around on their bed and jumping about. She also received three cookies and wrestled a dog! The dog was Chuck Testa’d though. Apparently Sofia’s daycare place is closer than I thought. In fact it might be the second closest option, but since it was hidden away in the forest, I didn’t know its location before passing by it today. Writing music has eluded me lately. I need to get on top of it again. It’s surprisingly hard to play guitar when you’ve got someone grabbing a hold of the fretboard and trying to remove the guitar from you..
I’m at week 10 of the Coachto10k program. I ran about 45 minutes today and it was hell on my legs. If I stick to the program it’ll only be three more weeks until I can run 10km, which will be an astonishing feat for me. I don’t doubt I can do it, but it’s just a question of keeping my head together. Sofia’s grown fast. I realized I haven’t mentioned her on my blog in ages. She’s quite the climber now and you gotta be ready to swoop in and pick her up from chairs and lower tables. 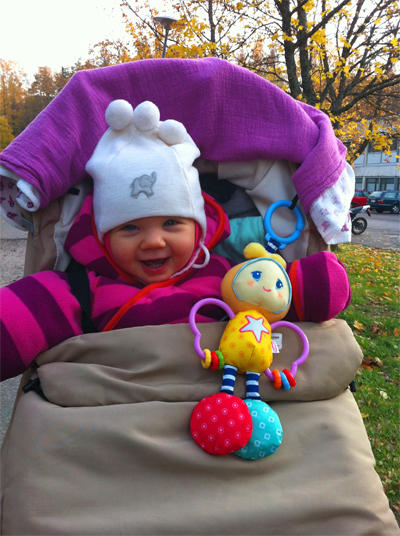 😀 They finally called me regarding the daycare center application and we got a daycare place not too far from us, only about 10 minutes by bus. Had a fun time at the new MXII rehearsal room with the guys from the other band inhabiting it. Things are moving along. I also got an offer to play in another band, but I’m not sure how that’s gonna pan out, yet. And damn, my legs are killing me. Life has been slow lately. Still waiting for things that are beyond me to either end or begin. Meanwhile I’ve been listening to some new podcasts. I’ve dug Chris Hardwick’s Nerdist and of course Greg Proops’ The Smartest Man in the World, both comedy-related, but with a broad spectrum of topics. TSMITW has some political and sport tones, while Nerdist has some.. you might’ve guessed it, nerd and on top of that show biz tones. I especially enjoyed the newest episode of Nerdist with Penn Jillette and the stories he has. Sometimes it feels to me like a person is measured by the stories they have. I’m not much of a story-teller. It feels like I stumble through important details and then stutter the punchline. 😀 I do like writing though, because you have time to think through your story. 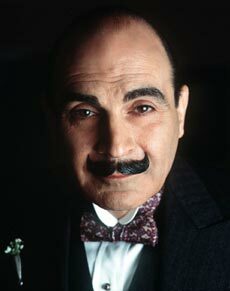 I’ve been watching Hercule Poirot from YLE’s web service. Gonna watch the latest made-for-TV movie tonight. One and a half hour of mystery and drama! Otherwise life’s been ticking along in the same old way. Both the negatives and positives. Got some interesting projects coming up, though, and by the looks of it, Mercalli XII has been reinvigorated with the recent rehearsal space upgrade. Sometimes things are just a matter of time. I’ve also been playing some Minecraft, but I haven’t done anything supercool in it. I wish version 1.9 were released already, so I could stop thinking “whatever I create will vanish once the update arrives…” and start creating things with a longer lifespan. Ze'grey cells. He haz 'em.